What did I eat in Turkey? A lot of good things, I tell you. Having homemade Turkish food every day for three weeks straight was heaven. I am not ashamed to say my mother-in-law spoiled me with delicious meals each time I sat down at the kitchen table. Even the snacks were elaborate with an assortment of dried fruit, nuts and cookies. Definitely puts my usual bowl of popcorn to shame. One afternoon, while I was working I was gifted homemade plum juice. Another time while watching TV a plate of cookies appeared. I definitely gained weight and I do not regret it one bit. I ate so many different dishes over this past visit-some familiar, some new. Even after living and frequently visiting Turkey, I realize I’m just beginning to understand what Turkish food is. Each region has its own specific dishes, and I’ve only got to sample a tiny bit of the cuisine throughout Izmir and the Black Sea region (where Mustafa’s family is from). So without further ado, here’s a small sampling of the deliciousness that I consumed. The morning meal will always be near and dear to my heart. There are the usual suspects: tomatoes, cucumbers, peppers, (some are spicy, which I learned the hard way), honey, cheese, jam and lots of bread. Main dishes for breakfast are usually egg-based, like menemen (runny eggs with peppers and tomatoes) or yumurtali ekmek (savory French toast). There is also Izmir-specific pastries called boyoz, that are flaky and delicious. Mangal in Turkey is not taken lightly. There is usually the main dish (either fish or meat) that is grilled over the fire and the many veggie side dishes. Simple salads and grilled veggies usually round out the meal. It’s as good as it sounds. My favorite is kofte (grilled meatballs), with a generous helping of buttered rice. 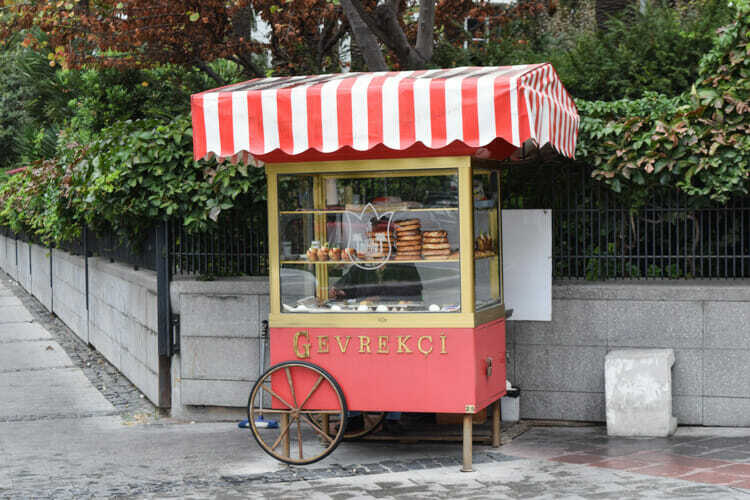 You cannot have a meal in Turkey without bread of some form, whether it is a freshly-baked loaf, gozleme (flatbread) stuffed with spinach or borek (pastery) stuffed with ground beef. I definitely felt the carb-overload, and tried to eat less, but eventually gave into the fact that you cannot avoid bread. It’s everywhere and it’s utterly delicious. If I could live off of one Turkish food for the rest of my life, it would be kofte, quickly followed by sarma (rice wrapped in grape leaves). My mother-in-law knows this and always has them on stand-by. Lahmacun (a flatbread with ground beef and spices) is my favorite fast food. Pile it with tomatoes, peppers and arugula, squeeze a bit of lemon on it and you are in for a treat my friend. One dish that was new to me, but quickly became a favorite was madimak, a veggie dish with tomato sauce from the Black Sea region. There was also bezelye, another veggie dish that helped balance out all those carbs. Mustafa’s aunt made manti for our farewell dinner, which is similar to small dumplings, stuffed with meat in yogurt sauce. It was definitely the best version that I have ever had. You cannot talk about food in Turkey without mentioning the copious amounts of tea that is drunken with each meal and in-between meals as well. I’m not a huge fan of drinking tea with meals, but it quickly becomes second nature and is strangely soothing. There is also Turkish coffee, which is grainy and strong. I’m not a fan of coffee in general, but drinking Turkish coffee with sugar and a few cookies is something that I will never pass up. Partly because you can get your fortune told at the end through the grounds. What are your favorite Turkish foods?